High heels don't have to mean high pain. A podiatrist gets fed up with women's shoes and decides to build and design her own. Those are not the adventures podiatrists typically experience. But then again, Oloff is not a typical podiatrist. Under a brand that bears her name, she is on a mission to change the way women’s shoes are constructed — even if it sparks a few disagreements with shoemakers. “When you’re a female and American, going to a place like Italy and telling them there’s a better way to make shoes, it’s not always well accepted,” she said. Oloff grew up in the retail shoe business. Her grandfather opened a shoe store in Brooklyn, New York, in 1920, and when she was old enough to pitch in, she went to work. But her dad encouraged school, not shoes, for her future. And when it came to picking a career, Oloff stuck with feet. Throughout her years practicing podiatry, Oloff recognized a common concern among patients. “I was tired of 50-year-old women coming to my office apologizing for the condition of their feet because they liked heels,” said Oloff, whose practice is based in San Francisco, California. Bunions, hammertoes, neuromas and metatarsalgia are often results of wearing uncomfortable shoes. And sometimes, the consequences are worse. “Women even come in with stress fractures from going out at night and dancing or repetitive stress — you know, all that pressure on the ball of your foot just creates a lot of problems,” Oloff said. Oloff knew how to fix “the construction of heels,” but it took her awhile to find the courage to do so. Four years ago, she finally got to work redesigning the foundation of the shoe (the last and the insole). “If you were building a house, would you start with an interior designer? Or would you start with your structural engineer?” she said. Oloff lines the insole of her shoes with 4 millimeters of medical-grade shock-absorbing material, and includes a pad that provides both arch support and metatarsal support. Her heels, many of which have built-in platforms, also take the pressure off the ball of the foot. “I can go down into the insole and make it so your metatarsal heads float, so those things that cause pressure from metatarsalgia, nerve problems, hammertoes — all those things, because [the heel is] unstable — those go away because we can actually offload the ball of your foot,” Oloff said. Many tweaks are similar to those found in orthotics, but Oloff said when the changes are made to the shoe structure and not added in as an afterthought, there’s more flexibility to make the outside of the shoe aesthetically pleasing. Her suede and leather boots have 4-inch heels, as do her leopard-print pumps. Gayle King has been snapped in Oloff’s Gigi sandal, and soccer star Brandi Chastain sported the Bethany slide. Oloff’s line, which ranges in price between $265 to $420, also includes flats, but unlike those commonly classified as “comfort shoes,” her loafers are closer in category to the designer display at department stores. 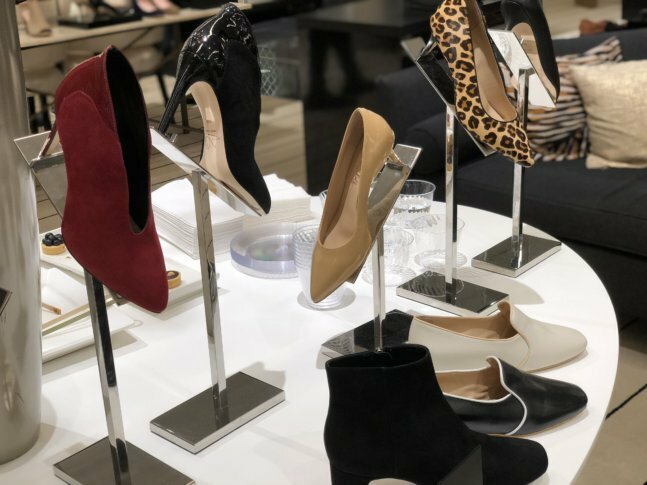 After a few years selling her shoes online and out of her medical office building, Bloomingdale’s approached Oloff to do a test run in its San Francisco store. Now, Oloff and her shoes are touring cities around the country, including a recent stop at the Bloomingdale’s in Chevy Chase, Maryland. The department store is also selling select styles on its website. “Mark my words, this is the beginning of something totally new — a totally different category that hasn’t been done before,” said Oloff, who added that there’s never been a better time to bring a change to women’s fashion.